The bizarre and inexplicable ban on the use of a cage for MMA fights in the Australian state of Victoria was lifted this week which was excellent news for both fighters and fans in the region, with UFC 193 already confirmed for November 15th. If there was one incident which perfectly encapsulated the innate ridiculousness of a regulation which prevented MMA fights being held in the safest possible environment it came at an Australian Fighting Championship (AFC) show in Melbourne on December 14th, 2013. Naturalized Australian Gustavo Falciroli, who is currently ranked as the top bantamweight in the region, was taking on seasoned New Zealander Kaiwhare Kara France and midway through the second round the Brazilian born fighter knocked his opponent out of the ring with two hard knees. The first knee connected clean with Kara France’s midsection and the second landed flush in the face. Instead of celebrating a KO, however, Falciroli found himself walking away from a no contest because the New Zealander had fallen through the ropes and banged his head on a ringside table. 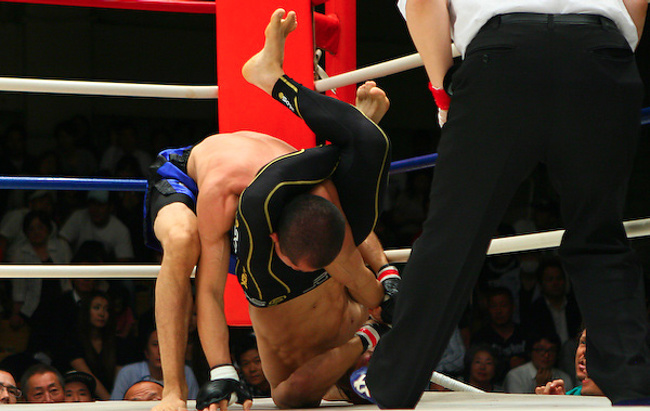 As a BJJ black belt with seven submission wins to his name, Falciroli would usually benefit from fighting in a ring because mixed martial artists often use the solid structure of the Octagon wall. Than can either defend takedowns or work their way back up after being put on their back but he maintains that there is only one truly safe setting for an MMA fight. 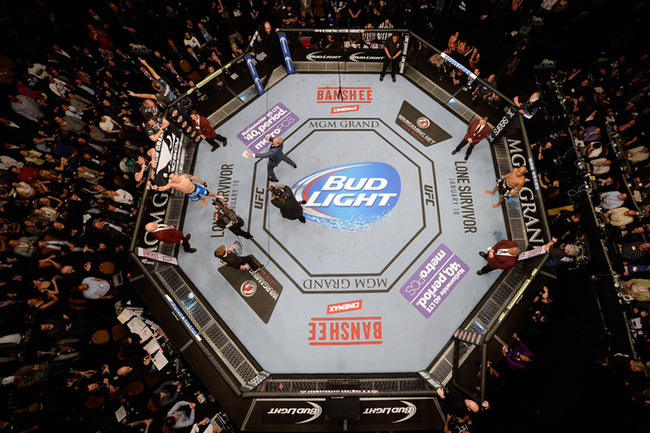 The most famous cage in the world is of course the UFC’s patented Octagon and within hours of the news breaking in Australia that the ban had been lifted the world’s premier MMA promotion announced that it had a date locked in for a pay per view card in Melbourne later this year. Tom Wright, the UFC Executive Vice-President and General Manager for Australasia and Canada, hailed the recently elected Labor government’s decision to repeal a rule which required MMA fights to take place in boxing style rings. “This is a major milestone for mixed martial arts in Victoria, which will allow the sport to flourish while at the same time better protecting its competing athletes,” he said. UFC 193 will be the organization’s seventh event to take place on Australian territory and Falciroli, who is currently ranked as the country’s best bantamweight and boasts a 14-4-2-1 record, hopes to eventually compete inside the Octagon himself. Falciroli saw his hopes of securing a spot on TUF: ‘Smashes’ in 2012 scuppered due to a delay in receiving Australian citizenship but he is now a fully fledged Aussie and says he has proudly represented his adoptive country since the day he made his professional debut in 2007. While a spot on the UFC’s first ever card in Melbourne would be a dream come true for Falciroli, he says it is on the backburner for the time being due to some injury issues. While Falciroli will be out of action for the foreseeable future MMA fans in the state of Victoria can look forwards to witnessing a live UFC card for the first time as well as a shift that is likely to see local promotions in the region start hosting fights in Octagons instead of rings. Adam Milankovic is the CEO of AFC, one of the country’s most renowned MMA organizations, and promoted both the original bout between Falciroli and Kara France—a rematch which the Brazilian born Australian won via submission. He is delighted that the days of fighters falling through the ropes can be consigned to the dustbin of history in Western Australia, and says any future AFC fights there will all be held inside an Octagon.